One of the most amazing things about the comedy work Phil Lord and Christopher Miller are doing these days is that they make it look so easy. The Lego Movie seems positively effortless in the madcap, sweeping way it paces its action and doles out its jokes, but when one starts unpacking the film, and analyzes the many intricate and thoughtful mechanics that go into making the characters pop and the story have weight, there’s clearly a lot of inspiration and intelligence there, and the same can be said of their first 21Jump Street film. It’s easy to single out the film’s biting self-awareness as key to its success, but that’s only a starting point, and it’s the way the film built real, meaty themes about friendship, stereotypes, and the ways in which we define ourselves through socially mandated gauntlets like high school that really made the characters and humor pop as intensely as they did. These films look effortless, but there is a rigorous understanding and development of narrative and ideas at work underneath, and I think that’s more apparent than ever in 22 Jump Street. The film is so immediately and intensely entertaining, so funny and creative and genuinely surprising, that the level of cinematic achievement on display can be easy to overlook. 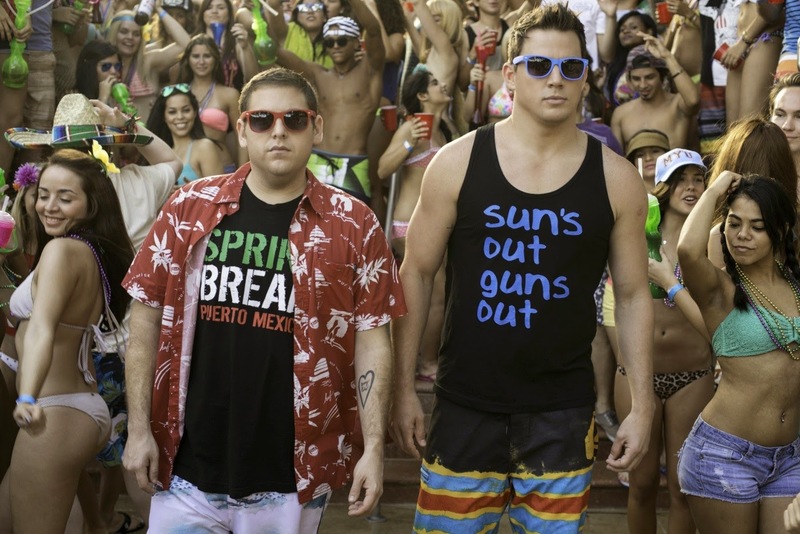 22 Jump Street is a truly great comedy sequel, and that in and of itself is no small feat. Sequels are tough no matter the genre, but comedy follow-ups seem nearly impossible most of the time, given how difficult it is to quantify or recreate great comedic energy. Yet 22 Jump Street is every inch as good at its predecessor, if not superior in some ways, and while it would, again, be easy to reduce the creative success to self-awareness, there is so much more at work here. The film viciously lampoons the fundamental follies of Hollywood sequels every chance it gets, but like the remake-based satire in the first film, that’s only a jumping-off point. The film is structurally fascinating, starting out as a very self-conscious retread of the first movie’s plot – as Nick Offerman’s hilariously deadpan police chief notes, people are only happy when one repeats a successful formula, so officers Schmidt (Jonah Hill) and Jenko (Channing Tatum) are sent to once again find the supplier of a dangerous new drug, this time at a local college – but it very quickly evolves into something unique and unpredictable, with Lord and Miller doing much more than simply winking at themselves. I think they are genuinely interested in our culture’s simultaneous obsession with and annoyance at creative repetition – Hollywood only makes the kind of sequels it does because we pay to see them, yet we do so begrudgingly – and how that strange hypocrisy is mirrored in the challenges of human relationships and identity. Schmidt and Jenko go into this new assignment fully aware that it’s a retread of something they did in the past, yet they cannot help but fall into the same patterns they did the first time around, falling too deep into their covers and overcomplicating a theoretically simple task. It’s a story about how easy it is to get stuck in a rut when we have something good, to take our relationships or skills or achievements for granted and milk them until we forget what once made them special, and while that works as a pitch-perfect explanation for how and why Hollywood drives good ideas into the ground, it’s also a poignant piece of insight into human nature. This is something we all struggle with on a daily basis, and for many, I think college can be ground zero for that internal conflict. It’s such a weird period in our lives, when we make this abrupt and absolute scenery change, leaving home and family and much of what has thus far been familiar behind, and yet the substance of what college is – classes, social groups and hierarchies, peer pressure, etc. – is fundamentally similar to high school in so many ways. That’s the trick movie sequels try to pull over our eyes – it looks new, yet is the same underneath – but it’s also part of our cultural myths about college, and I think one of the greatest challenges anybody encounters their Freshman year is navigating that disorienting balance between possibility and familiarity. Does one stagnate and remain the same person they were before, or does one consciously try to evolve? That’s what 22 Jump Street is all about, and as the film goes along, and cracks start appearing in the recycled plot structure, and Schmidt and Jenko start drifting apart due to reasons that are functionally similar but thematically different to what happened in the first film, the sequel becomes legitimately fascinating and immensely poignant – in addition to being uproariously, unceasingly funny. For as many ideas as I feel there are to unpack here, 22 Jump Street is, first and foremost, hilarious, and unceasingly so. It is possible I have never laughed this hard this consistently in a movie theatre, and seeing the film with a big, full audience was a real joy, as I doubt one second passed without somebody in the theatre laughing heartily. It’s just that kind of comedy that is on fire and in tune with its audience from start to finish, and while there are plenty of films I find ‘funny,’ very few transcend to this level of sheer uproariousness. And that’s where Miller and Lord’s commitment to smart storytelling and big, rich ideas really pays off, because while I can name one or two all-time great comedies that earn their laughs through sheer, irreverent silliness – Monty Python and the Holy Grail, for instance – I feel it is generally a rule that a great comedy must have a strong, beating heart, and that its laughs must extend from something intelligent, concrete, and purposeful. That’s a principle that goes all the way back to the very beginning of film – Charlie Chaplin believed that identification was key to making people laugh – and it’s fundamental to Miller and Lord’s comedy. We laugh because we love these characters, and we find them interesting and compelling as people, and because their struggles, funny as they are, bear so many elements of truth. As always, Miller and Lord go for some truly insane, wondrously silly gags here – no comedy directors working today understand the power of wild, unhinged, guilt-free lunacy as they do – and they are always free to go as far as they want because the foundations of the story are so honest and poignant. On its own, a ludicrously madcap car chase or absolutely bonkers action scene (of which 22 Jump Street contains several) is just zany; it’s when such efforts are wrapped up in a package with real weight and purpose that they produce the biggest laughs. The cast, of course, is an enormous part of the film’s comic success, and Jonah Hill and Channing Tatum continue to be one of Hollywood’s most unlikely and effective on-screen pairings. They have a chemistry unlike anything I have ever seen, raw and honest in how they play the many joys and frictions of friendship, while their comedic energy is built of spontaneity and surprise. Tatum in particular is just a genius of a performer, nearly every one of his comic beats arriving out of left field to land with hilarious, disorienting impact. They are the heart and soul of the film, responsible for so many great and memorable laughs, and yet, just as in 21 Jump Street, I think Ice Cube walks away with the show. His police Captain Dickson is a fundamentally stock character, and yet Ice Cube attacks the role with such a specific, searing comic energy that the man pretty much blows the doors off the theatre every time he walks on screen. It’s more than just shouting obscenities – Cube has a truly inspired way with the rhythms of words and syntax, and he knows how to deliver every line like it’s the big, show-stopping joke of the movie. I bet he could read the phone book and make it funny, but they give him some great dialogue to work with, and the character’s role is expanded in brilliant, unexpected ways. The supporting cast is thinner than it was the first time around – there are some terrific cameos, but the villains barely register, and the new friends Schmidt and Jenko make at college function better as extensions of themes than they do as characters – and the third act, while extremely fun, needed to be just a touch more subversive or unpredictable to really drive home the film’s biggest ideas. Still, I think this is at least one magnitude funnier than the first movie, something I really don’t say lightly, and if isn’t necessarily thematically tighter than the original, it is more provocative and ambitious. In the balance, 21 Jump Street and 22 Jump Street are equally great films, and the way the second film works in conversation with the first makes the duology more than the sum of its parts. The ending of this film (and its audacious, absolutely uproarious end credits in particular) seems to pretty definitively draw a close on the series, and while that makes a potential third film seem entirely unnecessary, I am positive, at this point, that Lord and Miller would find a way to make it work if they wanted to. It’s possible that no set of filmmakers have made such a great name for themselves by taking on utterly superfluous projects, and yet every time they step up to the plate, they make something that feels fresh, vibrant, vital, and effortless. Their films are minor miracles, and 22 Jump Street might be the best one so far.